I love sparrows. Everywhere I've lived there are sparrows from Mexico to England, to Canada there's always our friends the cute, small, delicate and at the same time tough sparrows and I love them for that. I grew up hearing and seeing them. Anyways I setup a feeder to help them through the winter that btw came early. I just did it yesterday though. I know they're very cautious so they might take their time to come. It's hanging from a tree branch. I checked the seeds online and the mix is good for sparrows too. Any tips to let them know they can come over and have a snack here ? My cats don't go there, they're indoors and our neighbor's cat is indoors too. Patience. It takes birds a while to locate new food sources and often times they keep an eye on a new feeder for a while before trusting it enough to come to it. Have you seen birds in your area? If you have, chances are they'll be coming soon. What kinds of seed are in the mix? Is there a lot of activity where the feeder is ,I know the birds will keep away from my neighbor bird feeder if there is too much going around. And no, not much activity. It's in the front yard however not many people coming in an out all the time. Anyways I guess I'll wait and see if those cute little guys decide to come here. Maybe the birds can see your cats in the windows and that made them uneasy, just a thought. I bet when it get colder and less food to eat you'll plenty of birds using your feeder. I bet when it get colder and less food to eat you'll plenty of birds using your feeder. That's a possibility. And they're so cautious so yeah. We have the best luck with BOSS (black oil sunflower seed) so you might want to get a small bag and add that into your mix. We don't use mixes at all unless I happen to win a contest or take advantage of a giveaway that involves seed. (Yeah, I don't go after money prizes! I go after the precious seed prizes! ) We just offer BOSS, thistle, suet and now freeze-dried or roasted meal worms. I suspect, though, that the main delay for you is just that they have to find and get used to your feeders. If you see birds in the bushes but not at the feeders, you might want to move your feeder a little closer to the bushes. Birds feel more comfortable if there is cover within a few yards or meters. Keep the feeders at least 10 feet (~3 m) away, though, or squirrels can leap off the bushes to your feeders...and they eat like little piggies! As for cats in the windows putting them off--we have our feeders just outside the fence (about 10 feet). The dogs sometimes line up at the fence and stare out at the activity under the feeders--both squirrel and bird traffic--and they're totally ignored by the wildlife. They learn pretty quickly just how far the dogs are likely to come, and I suspect that they'll get used to the sight of cats at the windows, too. And I was wishing I had a telephoto lens so I could take some pics from the window without disturbing them. One of the birdies started to peck on the tree I wonder if they want to make a hole. have all kind of birds going to your feeder. I use to feed the crows and they would wait for me at 5 :30 AM and start cawing for me . A neighbor said the crows where waking her up at 5:30 AM so I had to stop feeding them , but they still come around and when they see me they start cawing to let the other crows know I am outside. Most people do not like crows but I do. Awesome, Koteburo!! 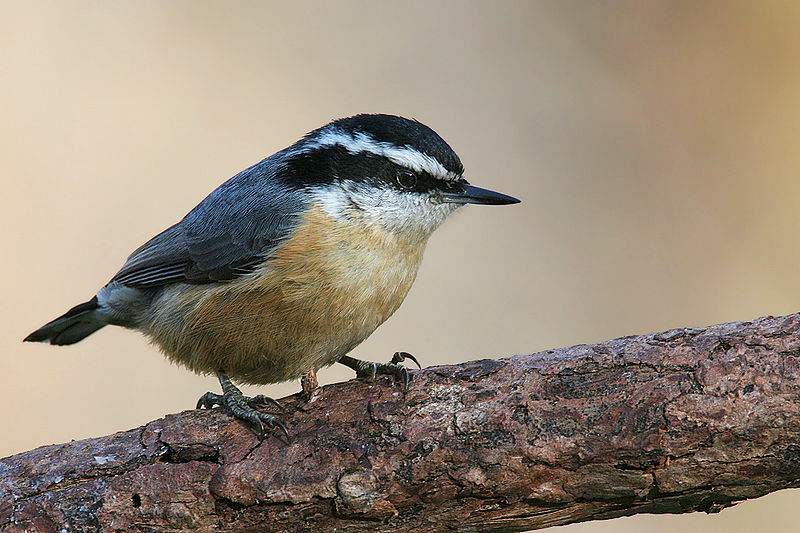 What a beautiful shot of your red-breasted nuthatch! He's a handsome devil! I put up 2 feeders, a silo and a platform. I use black sunflower seeds and it took the little piggies about 3 days to hone in on them. Now holy crow, the little cold snap we had wow!! They could empty both feeders in a matter of hours. We have sparrows, nuthatches, a couple of chickadees and since I just bought some peanuts in the shell, blue jays and I think they're flickers, not colourful but very pretty and big!! Saw a woodpecker today so I put out the suet for them. For some reason here, the bluejays prefer their peanuts in the shell and don't bother with sunflower seeds at all. Back in Ontario though, the bluejays would've lost out to the squirrels but here the birds actually get everything. Noella and Nino certainly enjoy watching them and Bayley tries to chase the bigger ones..hahah Magpies love to tease dogs!! When we had ours out at the old house we would sit on the front porch and watch the chickadees at the feeder and the squirels would get the peanuts and sunflower seeds on the ground. Have to find a way to put one up here. so pretty busy at the feeders this winter! Those little guys can sure go through the birdseed. Quieter right now but there's no snow here so they still come around but it looks like they're starting to build nests. I think the Meadowlarks are back and the crows are around. My friend in Kingston heard a robin the other day. The river didn't totally freeze so there were Canada Geese here all winter. I have a ton of Common Redpolls this winter. Soooo cute!!! They actually outnumber the House Sparrows for once, which I didn't think possible. There's even been a small group of White-winged Crossbills hanging around my huge spruce trees that I've never noticed before. The cats were absolutely transfixed by their rummaging through all the cones on the ground, and if it wasn't for their rapt attention out the window, I may not have seen them myself. Nino even discovered birdie watching!! Seeing him and Noella sitting side by side was sooo cute! !